Bronco's kit is molded in tan plastic and contains a small photo etch fret. This fret is for the engine fan, upper front grille section, sun visors, plate brackets and various latches and other small bits. 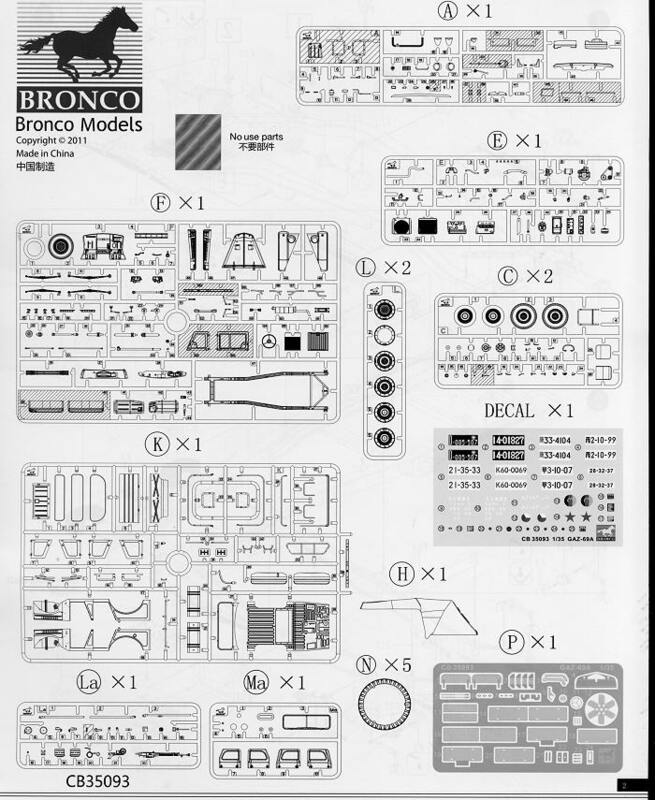 The kit is superbly molded as one has come to expect from Bronco kits. As you can tell from the etched bits, this one does have a full engine and one can display the hood open if one chooses. Other options are to have the doors open and the kit includes a canvas top piece if one doesn't want the rear bed open to the air. There are differences in how the rear bed area is built up if the rear canvas section is included so one needs to know how it is to be displayed before assembling that area. The interior is also well equipped with everything one would want from a well detailed kit, including frame seats, battery stowage box, all the usual pedals and a very basic dash. There is a full engine and complete drive train that includes the transfer case and detailed suspension. The wheels are those that have a separate wheel section for one side, making painting the wheels easy to do. There are also optional wheels and tires with different treads on the tires. As you can imagine, there is a full new sprue for this four door version that includes new body and interior bits. The kit also comes with a big machine gun that looks more like a small cannon for installing in the top down version. All the bracing for this gun is included in the kit. 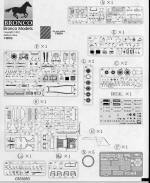 Instructions are very nicely drawn with some detail drawings to show how parts are fit in relation with each other. Color information is provided through the build in generic paint terms, though on the full color markings guide there is a chart that cross references to several major paint brands. 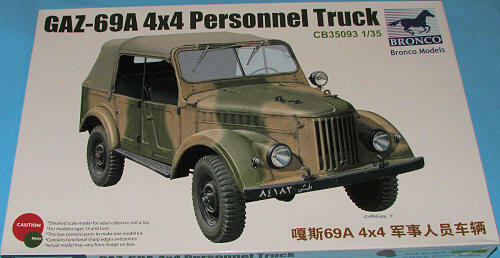 Most vehicles are dark olive green with black chassis and wheels and a khaki canvas top and side curtains. 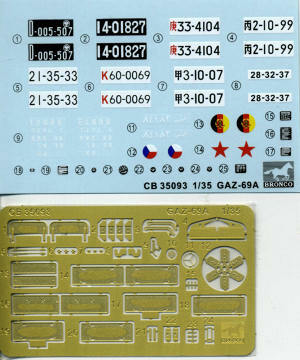 Decals are provided for ten vehicles, few of which are identified, though there are trucks from Poland, Czechoslovakia, Russia, East Germany and Syria. There is one from China as well as the reference vehicle for this kit is in a Chinese museum. The decal sheet is well printed and should work quite well. Once again, Bronco has come out with a very nice light utility vehicle that was widely used and widely exported. Though it is parts intensive, the end result should be a superb model.